A gourmet picnic lunch is spread out on the rocks along side a waterfall in the Mealy Mountains in Southern Labrador, Canada. Served to the guests who boarded a helicopter adventure into the Mealy Mountains in Southern Labrador, Canada, is a gourmet picnic lunch. A type of living which most people only dream about, but is very possible while visiting Southern Labrador. 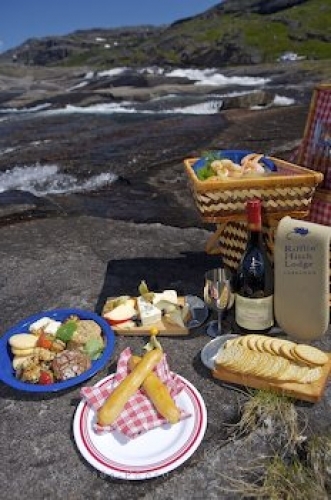 A bottle of wine accompanies this picnic lunch, which consists of cheese, crackers, bread sticks, various seafood appetizers and a mixture of other gourmet foods. This is what luxury living is all about and what better way to enjoy Southern Labrador, than atop the Mealy Mountains beside a rushing waterfall with your helicopter chariot waiting in the backdrop. Picnic hamper beside a waterfall with a Helicopter in the background in the Mealy Mountains, Southern Labrador, Labrador, Newfoundland Labrador, Canada. Picture of a gourmet picnic lunch in the Mealy Mountains in Southern Labrador, Canada.